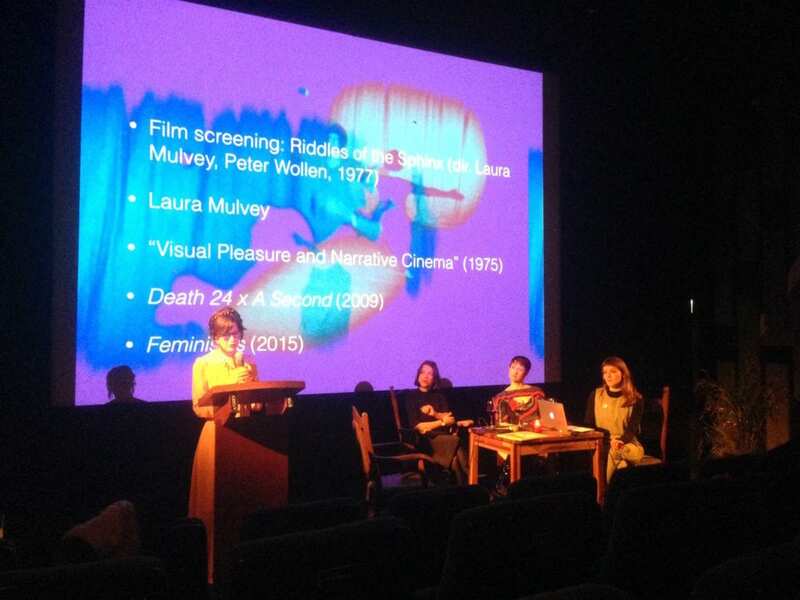 Anna Backman Rogers introduces a public screening of Laura Mulvey’s ‘Riddles of The Sphinx’ on International Women’s Day, 2017. Amsterdam, Netherlands. the growing approval of openly misogynistic, homophobic and racist political discourse evidenced by Jair Bolsonaro’s election to head office in Brazil. It is our duty and our wish to address and attend to these issues with nuance, thought, compassion and care. Yet this proves difficult given the pushback against feminism and the recent attempts by scholars such as Helen Pluckrose, James Lindsay and Peter Boghossian to undermine the legitimacy and relevance of vital discourses such as gender, sexuality, disability, queer and race studies in the name of so-called academic objectivity (a flagrant attempt to maintain the status quo). Their hoax is indicative of a worryingly pernicious and growing trend, as is the public and media attention given to controversy-baiters such as Jordan Peterson and Heather Mac Donald (amongst many others). In the last year alone, many amongst our number have experienced, at best, disrespect and dismissal and, at worst, outright aggression and threatening behaviour from the general public, and from students and colleagues alike in response to our attempts to do feminist work in the classroom, in journals, in artistic practices, in virtual and public spaces and beyond. This has been amplified by hate speech, threats and attacks on social media. Some of us have been followed, stalked, threatened, doxed, misgendered, and even assaulted. Some of us have had our reputations attacked, suffered through attempts to undermine the legitimacy of our work. Some of us have been petitioned to stop feminist pedagogy in favour of a so-called ‘neutral’ approach (which we take to be a white, western, heteropatriarchal approach to disseminating knowledge). This has to stop. We refuse to hold off and enable this backlash towards our work. It is vital that we continue this work, now more than ever. But we cannot do this without wider structural support. It is exceptionally important that institutions understand the sheer amount of energy, persistence, passion, and selflessness that forms the very basis of feminist work in the face of belittlement, dismissal, lack of understanding, outright sexism, microaggressions, violence, assault and threats on a daily basis. That we are frequently characterised in highly sexist terms as hysterical, overwrought, oversensitive, over-emotional, unbalanced, taking refuge in ‘victimhood’, aggrieved, mendacious, prone to exaggeration, clouded by anger, unable to form judgements with so-called dispassion, loud, manipulative, aggressive, troublesome, childish, irritating etc. when we raise these issues is telling. Equally problematic are assumptions that a lack of assertion or aggression means that a woman is less capable, less dynamic or, less intellectually rigorous. We are multiple and diverse in our approaches. These contradictory characterisations, when weaponised, work to silence and undermine valuable feminist speech and work. It is, therefore, vital that our institutions and colleagues understand what we are up against when doing feminist labour. It is not work we undertake lightly or half-heartedly. It often has severe repercussions for our mental and physical wellbeing. We require respect and basic support to carry on this work, and we ask that our colleagues recognise this. Being an ally is not a label that reaps dividends: it is a form of ethics and work. We ask, merely, that our colleagues embody their work/identity as allies in the form of action and not specious performance, empty rhetoric and virtue signalling. It is our contention that this hostile climate is the result of a broader, reactionary political environment that attempts to shut down and dismantle critique and analysis of the causes behind this fractious and terrifying moment through which we are all living. It is an attempt to reverse the progressive work that has been done in the fields of feminist, decolonial, queer, disability, Indigenous, and race studies, and the work of feminist activists, writers and artists at large. In short, it is an attempt to re-confirm and re-establish white, heteropatriarchal supremacy in all its multifarious and damaging forms. In light of this, it is therefore vital that we carry out this feminist work in our scholarship, our art practice, our writing (for traditional and digital media), and in the classroom as a form of activism precisely because of the lack of representation, the mental and physical suffering, the divestment of rights and protection and very real sense of attrition experienced by those who are most vulnerable right now (the bodies of black and brown, ethnic minority, Roma, Latinx, Indigenous, gay, lesbian and bisexual, trans and non-binary, single mothers, working poor, differently-abled, immigrant, homeless, refugees). It is also imperative that we have stable (i.e. not precarious) working conditions in which we are able to work towards long-term cultural and curriculum change rather than become distracted from such engagement because our energies are focused on pure survival. Those in long-term, stable and respected positions need to recognise that pulling the ladder up behind them as they progress in their careers makes them part of the problem: that those who are most precariously employed or poorly paid are often those who are most willing to strike or to take action to change damaging working conditions is telling in this respect. The brunt of emotional labour at work should be shared by all, and this requires vigilance and consideration. Those in long-term, stable and respected positions should strive for long-term positions for all entering the system, and sensitise young and precariously employed colleagues about their rights in the workplace. We all need to work together towards making this system better for all. This is feminist work. It only happens collectively. With this letter, we do not ask for special treatment or favours. We ask that the institutions in which we work recognise that this is an especially difficult, precarious and potentially dangerous moment for scholars, students, teachers, writers, activists, and artists alike trying to carry out critical analysis and conduct feminist pedagogy intersectionally and as intersectional allies. With this letter, we ask that employment, security, and health and safety policies are extended so that we can carry out feminist labour without fear of attack, assault, recrimination and attempts to undermine our authority. We counsel our institutions, with the help of colleagues, to issue statements in support of the importance of feminist labour and pedagogy and to uphold actively those who are doing this work by putting in place legislation that prevents colleagues and students from attacking those doing feminist work. Indeed, we suggest that it may be necessary for students taking these classes to sign some form of legislation or contract stipulating best ethical practice and behaviour so that this work can continue in peace. Work, we add, that is so necessary in this politically turbulent and troubling moment. Dr Anna Backman Rogers, Reader in Feminism and Visual Culture. University of Gothenburg, Sweden. Co-Founder and Co-Editor-in-Chief of MAI: FEMINISM AND VISUAL CULTURE. Dr Leanne Dawson, University of Edinburgh. Dr Megen de Bruin-Molé, Teaching Fellow in Digital Media Practice, University of Southampton. Dr So Mayer, independent scholar, UK. Author, Political Animals: The New Feminist Cinema & co-founder, Raising Films. Dr Jo Lindsay Walton, Postdoctoral Research Fellow, Sussex Humanities Lab, University of Sussex. Valeria Villegas Lindvall, PhD student in Film Studies, University of Gothenburg. Daniel Massie, PhD candidate in Film Studies, University of Glasgow & University of Strathclyde. Connor Winterton, PhD Candidate in Media and Cultural Studies & Associate Lecturer, Birmingham City University. Dr Ana Basiri, Lecturer in Spatial Data Science and Visualisation, University College London. Linnéa Saaranen, MA of Arts in Film Studies, University of Gothenburg. Dr Juan Velásquez, Associate professor/senior lecturer in Gender Studies, Department of Cultural Sciences, University of Gothenburg. Margaryta Golovchenko, Undergraduate Student in Art History and Literature & Critical Theory, University of Toronto, Canada. Virgínia Jangrossi, M.A. at Universidade Federal de São Carlos, Brazil. Dr Neil Fox, Course Coordinator and Senior Lecturer, Film, Falmouth University. Matt Grimes, Birmingham School of Media, Birmingham City University. Professor Rita Marcella, Robert Gordon University, Aberdeen U.K.
Dr Elizabeth Watkins, Research Fellow in History of Art and Film, University of Leeds. Graham Minenor-Matheson, MA student Global Media Studies, Stockholm University, Sweden. Professor Annie van den Oever. University of Groningen, Netherlands. Dr Kate Taylor-Jones, East Asian Studies, University of Sheffield, UK. Dr Annika Bünz, University of Gothenburg. Professor Hilary Robinson, Loughborough University. Elspeth Mitchell, University of Leeds. Dr Martin Fradley, University Of Brighton, UK. Dr Nigel Morris, University of Lincoln. Professor Andy Miah, University of Salford, Manchester. Prof. Ola Stockfelt, Musicology and Film. University of Gothenburg, Sweden. Adam Herron, Postgraduate Researcher, School of Art, Media and American Studies, University of East Anglia. Dr Paul Mullins, Reader, Psychology, Bangor University. Dr Margarita Navarro Pérez, Lecturer in Modern Languages, University of Defense in San Javier. Prof. Sean Homer, Professor of Film and Literature, American University in Bulgaria. Michael Samuel, PhD Candidate, University of Leeds and Visiting Lecturer, University of Birmingham. Dr Steffen Krüger, postdoc and lecturer, Dept. of Media and Communication, University of Oslo. Dr Cat Mahoney, Derby Fellow in Communication and Media, University of Liverpool UK. Panagiotis Kourtesis, PhD Researcher in Experimental Psychology & Cognitive Neuroscience, University of Edinburgh. Dr Stacy Gillis, Newcastle University, U.K.
Rachael de Moravia, Senior Lecturer in Journalism, University of Gloucestershire, U.K.
Dr Toni Sant, Director of Film & Digital Media, University of Salford, MediaCityUK. Ruth Gilbert, PhD student in Film & Television Studies, University of Glasgow, UK. Melissa Hair, PhD Candidate, Northumbria University. Dr Yelin Zhao, Seminar Tutor in History of Art, University of Leeds, UK. Inmaculada N. Sánchez-García, PhD Candidate in English Literature, Northumbria University, UK. Dr Ian McDonald, Senior Lecturer in Film Practice, Newcastle University, UK. Dr Ingrid Ryberg, filmmaker and Senior Lecturer, Department of Cultural Sciences, University of Gothenburg, Sweden. Sophia Kier-Byfield, PhD student, University of Loughborough; Part-time lecturer, University of Aarhus. Professor Tania Lewis, RMIT University, Melbourne, Australia. Susana Aparecida dos Santos, M.A. at Universidade Federal de São Carlos, Brazil. Helen Gubbins, PhD Candidate in Ethnomusicology, University of Sheffield, UK. Dr Chi-Yun Shin, Principal Lecturer in Film Studies, Sheffield Hallam University. Dr Reva Yunus (PhD University of Warwick), Azim Premji University, India. Prof. Paul Long, Birmingham Centre for Media and Cultural Research, Birmingham City University. Arman Heljic, PhD Student in Gender Studies, University of Gothenburg. Minoo Moallem, Professor, Gender and Women’s Studies, UC Berkeley. Dr Athena Bellas, sessional lecturer in Screen and Cultural Studies, University of Melbourne.